Now this is what exceptional service looks like. We’ve just finished a six-day, often scorching backpack along the spectacular Great Divide Trail, going north from Waterton Lakes National Park. Our tongues are practically scraping the trail as we reach our car at the Castle Mountain Ski Resort, in deep southwest Alberta. 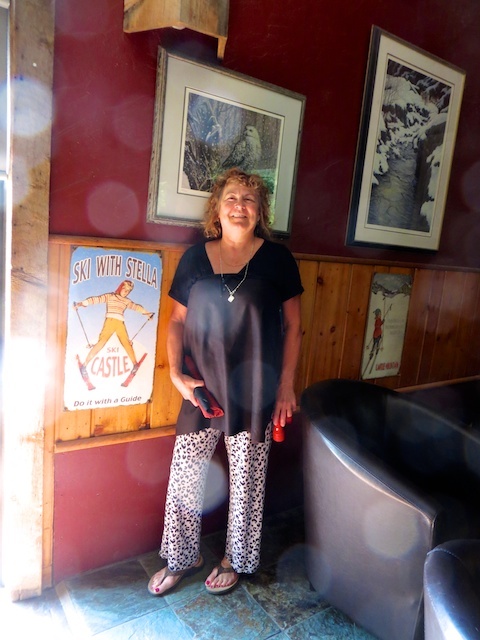 In we go through a darkened pub framed with historical posters from the ski resort, where Stella has skied since the hill opened in the mid-1960s. The inside dining area opens onto one of the nicest decks you’ll find anywhere—shaded by tall, deciduous trees, festooned with flowers, patrolled by a lithe but deaf 21-year-old cat and flanked with views across ranchland to the Front Ranges of the Rocky Mountains. Can you beat this patio—and all to ourselves? Best of all, we’ve got this lovely “middle of nowhere” place to ourselves, a private engagement if you will. 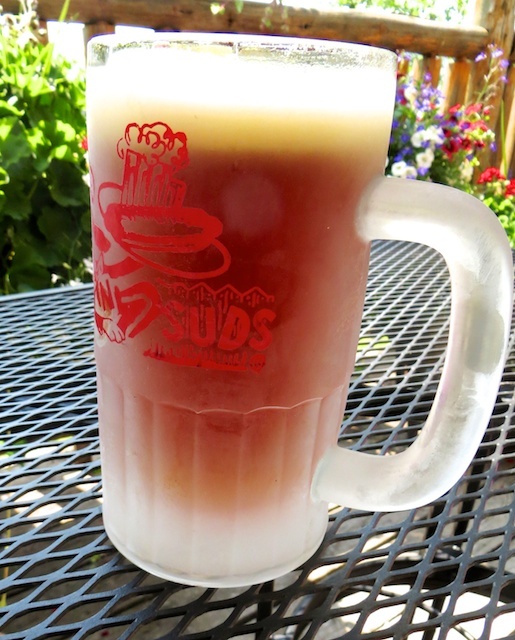 Well, it’s hard to beat the first sips of beer served in frosted mugs. 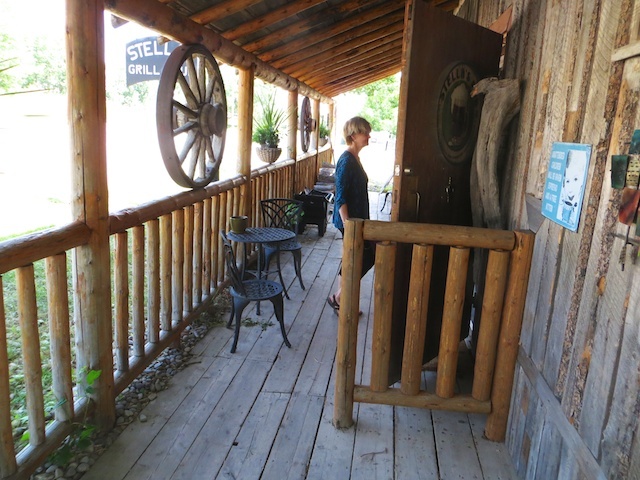 Then Stella (officially Susan White and self described as “innkeeper, chef, bottle washer”) disappears into the kitchen to prepare our burgers. My friends go with beef, and I consider haddock, but how can I ignore a crab cake burger? 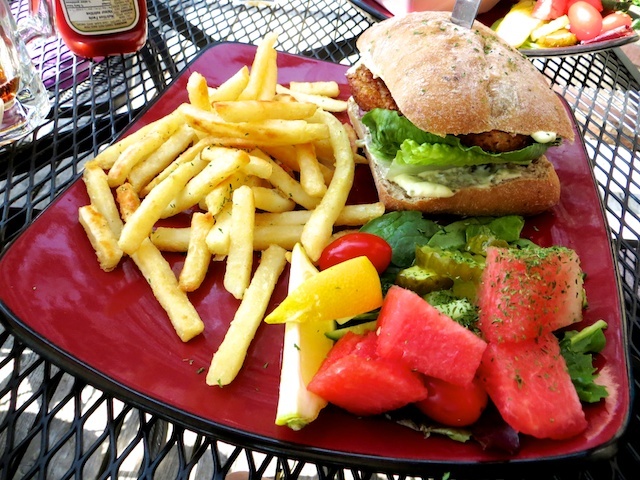 Not long after, three beautiful plates arrive, artfully decorated with oven-roasted fries, a little watermelon salad and burgers nestled inside ciabatta buns. My goodness! I know everything tastes better after a few days on the trail, but this would be a knockout even after an hour of driving. “I don’t like to boast, but I am a good cook,” allows Stella as I peruse an ever-changing dinner menu that, the night before, included lamb shank and featured an offering with truffle oil. “A lot of tourists as well as fishermen and duck hunters,” who also stay at the inn. I guess if you make food this good and keep an open-door policy, they will find you. 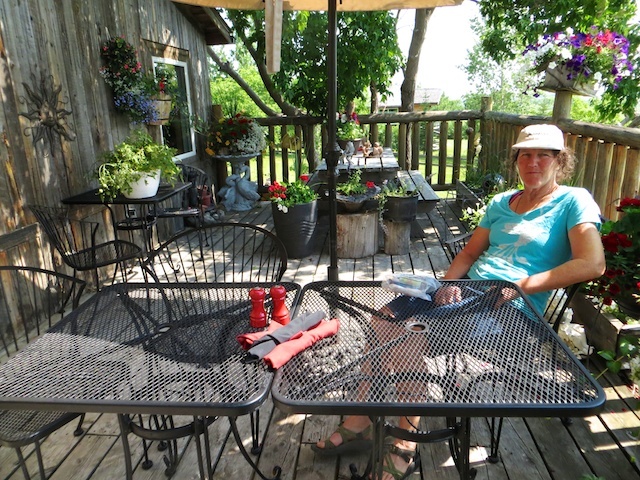 This entry was posted in Alberta, beer, burgers and tagged Beaver Mines Alberta on July 10, 2015 by bcorbett907. Mmmm, I want to eat there!